hope you're having a beautiful summer, Erika! $56? That's an awesome steal! Where do you find these things??? You need to write a book, I swear. I had to scroll back up to do a double take because they look so much alike!! Yup going for the cheaper one & writing down that brand. These are beautiful for hte fall!! I love tall boots, and I'd go for the Alloy here. They look a bit less fitted to the leg, and so maybe have a little more room to tuck skinny jeans into? leave it to me to love the pair that costs $798! oh my god so excited for fall. thinking of getting a pair of over the knees and customizing with some amazing studs or even beadwork... maybe. if i'm not too lazy. They look almost alike! But I'm going with the Alloy, I'm not paying $798 for a pair of shoes! 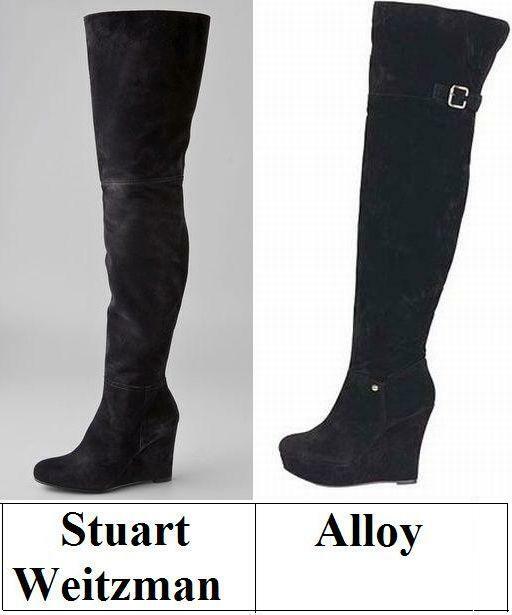 I actually prefer the Alloy pair! I love it when I come onto your blog and like the cheaper option more. I would go for Alloy! I love them and that buckle is so cute! You got me craving fall clothes now! swoon! your posts always melt my heart. i love all the heels you have pictures of. i can't wear them, because my bf is a shorty. Fabulous boots! They look identical.. And what a great price!!! Thanks for your wonderful comment, I love your header too. So cute!!!! Those boots are GORGEOUS! My heart is with the Stuart Weitzman pair! I love OTK boots. I kinda prefer the Alloy...I like the buckle! I will be a tightwad on this one for sure! gosh though, having a boot of real leather makes all the difference in the world. I'm swooning for the SW myself! I almost choked in my water seeing the Stuart Weitzman price, so much! And then I almost choked again seeing the other price! But both of the boots are lovely, tought they're very high! I love OTK boots but none of them I have. Both of them look great- for the meantime, I will go for Alloy, it's not too heavy on my pocket. WOW! I am loving the boooots! stylish! i saw some styling tips on shopbop's newsletter today...they have used fab boots like these!!! Hmm, I'm not crazy about the buckle on the Alloy ones. So even if their is a crazy price difference, I would prefer the Stuart Weitzman. I love the Alloy ones. The buckle on them makes them look so much better. very enticing! I do like alloy. time so start thinking fall, isn't it. love Alloy boot! I'm going tightwad all the way on this one. SW's boot is a beauty, but I need to conserve the moolah!! ps-so excited you entered for the ebelskiver pan. those little filled pancakes are so addicting. had chocolate strawberry filled ones yesterday. love! I like the fitted look of the Stuart Weitzman, but for $56.90 I'm going with Alloy! great choices, Erika! hope you are enjoying your week! Even though they look practically identical, I'm sure the suede on the SW is smooth like butter! Ugghhhh, Erika, you just reminded me I need to start preparing for fall. I am so sad for the onslaught of cold weather! well I am bias b/c I have a pair of Stuart Weitzman over the knee all leather boots from this past season and they are the best thing I bought all year! Love them with leggings and skinny jeans. It's all about the High-Lo theory. Im all for the 56.90 pricetag on the Alloy boots - great find! I couldn't tell the two apart if I tried my damnedest. Genius find, as usual. I think this one's the only one so far that I've commented on Tightwad Tuesdays that I like the bargain way better than the other one! Good one, girl! As much as I love this 1st pair, the Alloy boots are amazing for the price! I always shop at Alloy.com and always find great deals! I love it. I LOVE my Stus, but the price on those Alloy ones is too good to pass up! i think boots are always worth extra money but at 800 bucks... gotta go the cheaper route!!! But gosh, I love the first ones. Oh Erika, what a great find! I've been wrecking my brain about over-the-knee boots forever. I thought I decided against them, but for $57.-.... VERY TEMPTING! Alloy for me ! So cool and the prices are just so different . Wow . I NEED a pair of OTK boots! Great post!